Peyton Barber: Seven game wonder or more? The 2016 NFL Draft is full of talented players with stories to tell like Auburn’s Peyton Barber. The red-shirt sophomore is second cousins with former Cowboy runner, Marion Barber, and at his press conference in Indianapolis, the runner announced the reason he declared early for the draft was that his mother is homeless. This young man is all about overcoming adversity as he suffers from ADHD and dyslexia. I reviewed his game against Alabama and San José State to determine what skills Barber brings to the next level. 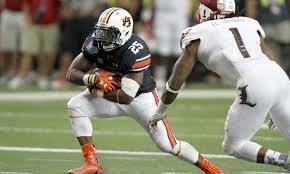 RB-Peyton Barber, Auburn 5’10” 228 lbs. Cons: The back does not have many football reps as he only started the first seven games of the 2015 season, getting replaced by Jovon Robinson in the final six games. The previous year he spent on the scout team which seems related with the way the runner took time to process information. There are a lot of complications in the pro game that he will need to process quickly, can he do that? Barber was very successful when fed the ball 23 or more times (in those six games he had over 100 total yards, while scoring 12 of his 13 touchdowns), but will he get that kind of load in the NFL? The runner needs to get better at reading his blockers hips. Also he was rarely used as a receiver out of the backfield with only eleven career catches (could have been more about his role in the offense). Pros: The former Tiger is a decent lead blocker that needs to see who he is blocking instead of tucking his head down. He has quick feet combined with loose hips (hops around at times), gets small in the hole, uses a mean stiff-arm, and finds the cut back lane. Barber changes directions without slowing down (great on counters), and spins or jump cuts away from trouble (performed well in the three cone and shuttle drills during the Combine). The back is not overly powerful, but gets decent leverage while keeping his legs driving. He has good balance and always seems to fall forward for extra yardage. As a receiver, Barber shows soft hands and can grab the ball in stride, including dangerous wheel routes. When the runner stays behind to pass block, he steps up into the blitzer while squaring his shoulders and anchoring well. Overview: While watching Barber, he reminds of former Michigan Wolverine/Cincinnati Bengal runner Chris Perry, another classic overachiever/maximum effort guy. The young back has a lot of obstacles to overcome, but heart isn’t one of them. I like his chances of sticking on a team playing a limited role in his early NFL career and earning major playing time after a season or two.